Some growers who straight combine canola that is not a glyphosate tolerant variety will apply glyphosate to even out the crop for easier harvest. When using glyphosate in this fashion, make sure a majority of the field is mature. Growers using Reglone on canola to be straight combined take note: Reglone can increase both pod shatter and pod drop if harvesting is delayed, so be prepared to combine as soon as green seed and seed moisture have reached suitable levels. Do you have time for high-green canola to cure? Growers waiting for green seed levels to drop before combining should weigh the risks. The best bet may be to harvest the crop now to maintain the yield and quality that’s there, and start looking for buyers. Why is desiccated canola not drying down? Good canola stand establishment, especially in direct seeding situations, starts with straw and chaff management for the previous crop. Spreading residue evenly across the field is critical. Harvest is a good time to assess your canola results and prep fields for canola in 2012. If yields were disappointing given the large biomass of the crop, take time now to check for clues as to why. A lot of canola hit by frost or swathed in the heat is now stuck with high green counts. Every field is different, so there is no one best answer. Here are a few questions to ask and sample scenarios to consider before making the decision to combine now or give the crop more time. Experienced straight combiners often want a frost to desiccate the crop and whatever weed patches might be present before they start harvest. If the crop is mature, the frost should not hurt quality at all. If frost hits before the crop is fully matured, swathing may give the crop time to cure and rescue more yield in the process. Check for major frost damage to pods before making this decision. If the forecast is for frost tonight, growers will not see much benefit to swathing today if canola is still green. With a light frost, crop left standing will still have a chance to mature further. A heavy frost will lock in high green counts unless the crop has adequate dry down time to achieve a seed moisture of 20% or less. This time of year, mature canola seeds can take a long time to turn brown or black. Growers wondering why seed color change is taking so long may want to check the fields again and look for these other signs of maturity: All seeds are firm to roll. White/yellow banding. No skin peeling. How much green will you have? Many canola fields that were swathed too early or during hot weather or both will have dried down without sufficient enzyme breakdown of seed chlorophyll, resulting in a high green count. Fields that are dry (less than 10% moisture) and still have 5% green are unlikely to see that green count drop much, unless canola seed moisture rises back up above 20% to allow green-clearing enzymes to restart. Did you have frost last night? Growers with standing canola are wondering whether to swath right away. Before making that decision, note the temperature and duration of the frost. Some elevators are reporting higher green seed counts. Swathing too early and swathing in hot and windy conditions are contributing factors in many cases. Cutting canola in hot conditions leads to rapid dry down and desiccation, which doesn’t give chlorophyll time to clear from immature seed. Waiting until less mature seed is at least firm to roll between thumb and forefinger will help minimize yield reductions from early swathing, but significant curing will still need to take place in the swath to remove green seed. Growers who want to swath green canola today may gain quite a bit by waiting 2 or 3 days, as long as the forecast suggests a low risk of frost. If half the field is just beginning seed color change, growers may want to hold off on swathing. By waiting 3 or 4 days, there is minimal risk of frost damage for riper parts of the field and a huge potential benefit for later parts if frost doesn’t occur. While forecast daytime highs are warm for the next few days, some areas may experience light frosts. If frosts do not dip below -2 C, damage is likely to be minor and swathing prematurely may do more harm than good. However, it is important to get out there and check crops to ensure damage is not greater than expected. In a situation where a field has matured more rapidly than expected and the majority of plants are beyond 80% seed color change, growers may be better off leaving the crop for straight combining. 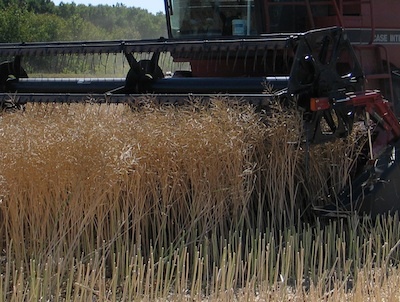 Swathing may result in costly losses. 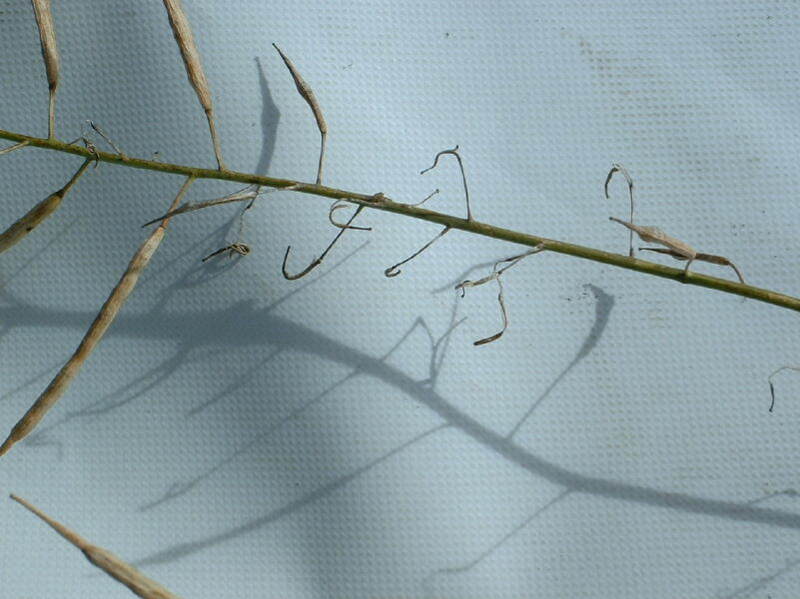 After a light frost of 0 to -2 C, damage is likely to be minor meaning swathing prematurely may do more harm than good. However, it is important to get out there and check crops to ensure damage is not greater than expected. What are the risks of swathing too early? Some growers anxious about the calendar and the typical date of first killing frost are swathing canola early, at around 10-15% seed color change. At this stage, many seeds on the side branches may be watery and translucent. If this represents 30% of seeds, for example, growers must recognize that early swathing could mean sacrificing a large proportion of that yield — regardless whether the frost comes or not. Just because pods look dry and mature does not mean the seeds are ready for swathing. Sunscald and diseases such as blackleg, sclerotinia and clubroot can make plants look mature but the seeds may still be green. The opposite can also happen where pods look green but the seeds inside are ready. When assessing a canola crop to see if it’s ready, crack open pods on a number of plants throughout the field. Cutting canola in hot conditions will lead to rapid dry down and desiccation. Chlorophyll may not have time to clear from immature seed, which locks in high green counts. If growers feel they must swath, wait until temperatures cool down in the evening and then swath at night to take advantage of those cooler temperatures and any moisture from dew. Swathing widths have increased in recent years to 30 feet and beyond. A heavy crop cut at thirty feet or more needs only gentle downward pressure on the middle of the swath to be anchored properly. Air movement within the swath is important during curing and dry down. Practice leads to perfect. Growers who successfully straight combine say that experience leads to success. If straight combining for the first time in 2011, be sure to start on a small number of acres. This will allow for some experimentation to determine how to make it work with an individual’s equipment.